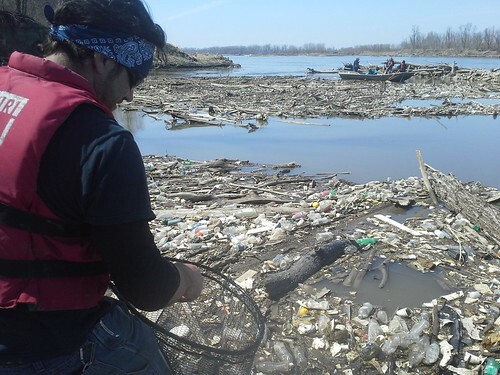 As part of the 24th Project Blue River Rescue on April 5, 2014, Missouri River Relief tackled a site on the Missouri River where floating trash collects downstream of the Blue River and Kansas City. We call this the "Missouri River Trash Trap". Here's a video and description of the project at Rivermile 350.9, just downstream of Kansas City. Project Blue River Rescue just finished its 24th annual clean-up along the banks of the Blue River, a troubled but still beautiful urban river. The event, held the first Saturday each April and organized by the Friends of Lakeside Nature Center, brings hundreds of volunteers together to clean up priority spots along the Blue. This year 1,200 volunteers, removing MANY tons of trash, recovered 1,000 tires, cleared 3 acres of invasive honeysuckle, and planted 300 trees. Sorry for the quality of the video - it was done on a cell phone! This clean-up was organized by Anniya Priesberga, one of the founding members of the Student Environmental Coalition at UMKC. 60 UMKC students and River Relief friends spent the day removing 1.4 tons of stuff from this trash-catching spot at Liberty Bend Conservation Area. We'll be posting more on our blog. Kansas City Parks and Rec. Site designed and built by Josh Nichols.